Sequoyah Chapter Daughters of the American Revolution (DAR) and American Legion Post 149 have partnered for a special Vietnam Veteran Commemorative Flag Raising Ceremony at Noon on Tuesday, March 29 on the Pickens County Courthouse front lawn. Their goal is unified…to give our Vietnam Veterans the well-deserved honor and respect that many never felt. The official Commemoration recognizes all men and women who served on active duty in the U.S. Armed Forces during the U.S. involvement in Vietnam from November 1, 1955 to May 15, 1975. The Commemoration makes no distinction between Veterans who served in-country, in-theater or were stationed elsewhere during those 20 years. All answered the call of duty. 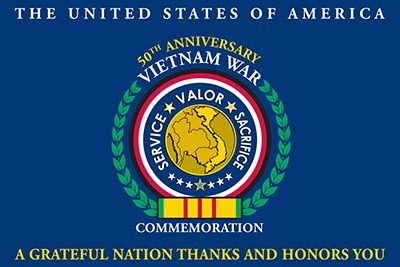 Department of Veteran Affairs Secretary Robert McDonald issued the following statement on November 2015, “I have designated March 29, 2016, as a day for our Department to express our tremendous gratitude and support to this generation of Americans through ceremonies across the nation.” Sequoyah Chapter DAR is an official Vietnam 50th Anniversary Commemorative Partner and asked American Legion Post 149 to partner with them in making the Flag Raising Ceremony a memorable event. The Commemoration Project’s success is based on the thousands of military and civic organizations across America signing up as Commemorative Partners. Today, there are over 9,650 partner organizations pledged to participate in local projects to recognize these military heroes and helping correct a wrong against these Veterans nearly 50 years ago. The five objectives of the program are to honor the veterans and recognize them as well as their families for their service sacrifices made to our country; to highlight the service and contributions of federal agencies and government and non-government agencies who worked with armed services; to recognize the many science, technological, and medical advances made as a result of research made within the war; and to recognize the sacrifices and contributions made by our allies during the war. The Commemorative flag is a key element in a Federal State and local program which was formed as part of the 2008 National Defense Authorization Act. Known as The United States Vietnam Commemoration, the group’s purpose is to recognize the 50th Anniversary of our involvement in South Vietnam. The first event occurred Memorial Day 2012 and will continue until Veterans Day 2025. Please join us to show your patriotism and support for our Veterans on Tuesday, March 29th in front of Pickens County Courthouse at 12:00 Noon to participate in this historic event. Flag detail and color guard will be performed. Names of Pickens County Vietnam fallen soldiers will be read and their memory will be honored with a special bugle rendition of TAPS. Speakers will represent the American Legion and Sequoyah DAR as well as special words from our County Commissioner.